Today I’m sharing Chicken Cacciatore which the Japanese would call it Chicken Tomato Ni (チキンのトマト煮). It’s a popular home cooked meal in Japan. My kids love this dish and it’s one of our favorite comfort food. I am not sure if my recipe follows the authentic Italian method but I hope you enjoy it as much as my family does! It's a popular home cooked meal in Japan. My kids love this dish and it's one of our favorite comfort food. I am not sure if my recipe follows the authentic Italian method but I hope you enjoy it as much as my family does! Sprinkle salt and pepper generously on the chicken. Cut onion, mushrooms, and garlic. In a large fry pan or pot, heat 1 Tbsp. 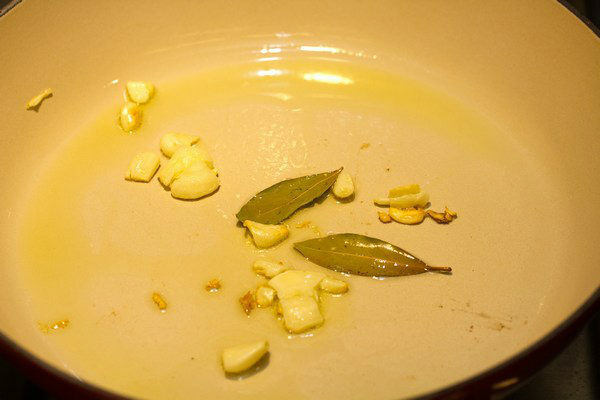 olive oil on medium heat and cook garlic and bay leaves till fragrant. 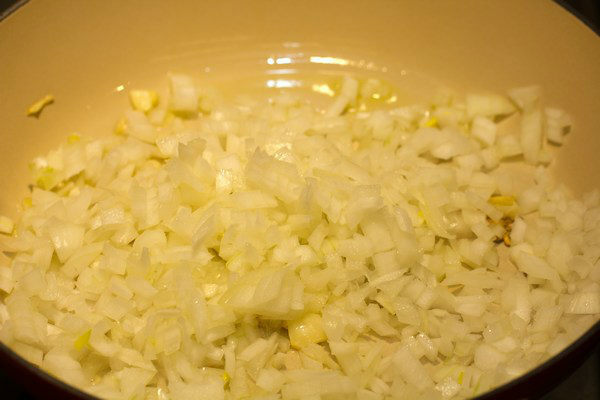 Lower the heat to medium low heat and sauté onions until tender. While onions are being cooked, heat 1 Tbsp. olive oil on high heat in a cast-iron skillet (or a large skillet). 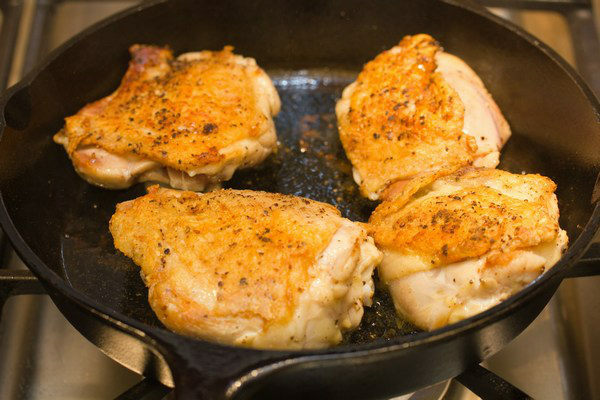 When the skillet is hot, cook the chicken with the skin side facing down first. Do not crowd the pan and do in batches if necessary. Once the chicken is nicely browned, about 10-12 minutes, flip the chicken over and cook the other side until browned, about 10-12 minutes. When both sides of chickens are browned, transfer to a plate and repeat this process until all pieces of chicken are done. 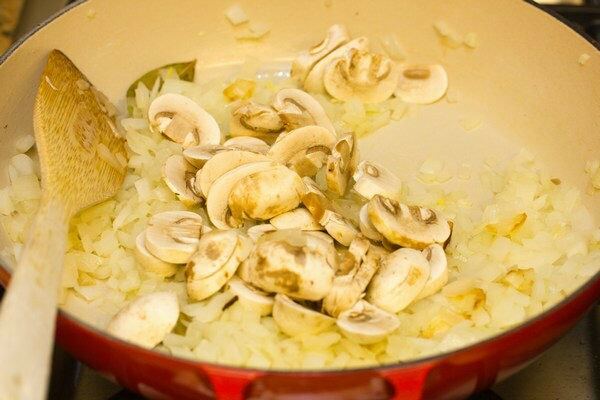 When onions are soft, add mushrooms and cook till tender. Transfer the chicken into the pan/pot, skin side up. Add wine, tomatoes, bouillon cubes, and oregano. Break the tomatoes into small pieces with wooden spatula. Cover with the lid and lower the heat. At a gentle simmer, cook for 60 minutes. Add salt and pepper to adjust taste if necessary. The picture below is after 60 minutes of simmering. Remove the chicken into a serving platter, and increase the heat to high. Let the sauce reduce for about 2 minutes. The sauce should start thickening. Pour the sauce over the chicken and garnish with parsley. Serve with pasta. Congratulations! That is so nice that you will be writing every Wednesday for the site! This is a terrific tutorial of a delicious meal. Your dish looks fabulous! I don’t know how Italians prepare it (yes, although I’m Italian), ’cause I never made it myself. In Italy “cacciatore” means “hunter”, while “cacciatora” is the hunter’s jacket or something like “as hunters do that”. So, in this case, the name would be “hunters recipe to cook chicken” 🙂 And I always ate it in a tomato and veggie sauce with no mushrooms, but yours is a very nice variant! Interesting! Thanks Giulia. Really? Even neighbor countries don’t follow original Italian way. I’m so used to eat pasta as a substitute of rice or bread, in a way. Haha. It must be so strange for you. I have seen a lot of Japanese food being in “wrong” and “weird” way too… haha. A yummy, comforting, fantastic meal! Beautiful dinner! My family would be happy to see this delicious entree on their plates 🙂 Congrats on the guest post! Congrats on your guest post! And what a delicious looking dish! Comforting indeed!!! Ohh yum! 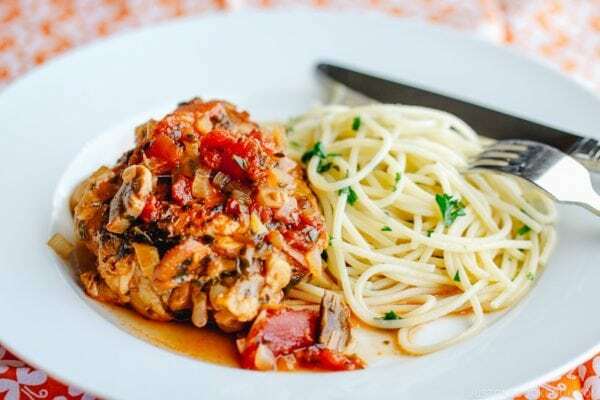 Growing up in an Italian-American household we had chicken cacciatore often (and yes, Giulietta with pasta – us Italian-American eat EVERYTHING with pasta!). This version looks great. My dad includes sliced green and red peppers in his as well. You’ve reminded me how much I love this dish. Congrats on the new column! OMG! 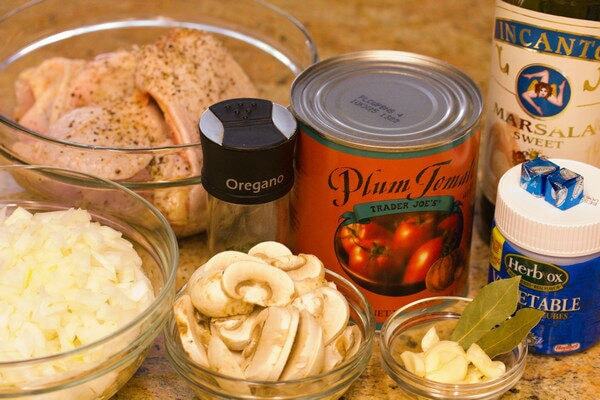 The first photo on your “Chicken Cacciatore” almost blown me off. It look absolutely stunning and it makes me sooo hungry after running thru the post and recipe. thumb up!!!! Congratulations Nami!!!! You must be very excited! I must say I have never had this dish before, although I have heard about it so many times. It looks delicious. Thank you Sissi! Japanese eat many kinds of pasta at home or even at restaurant, and this is more of homey pasta. I love all kinds of pasta with tomato sauce… meat sauce is still my #1 pasta and it’s very nostalgic dish to me. I’ve never had this, but it looks very good! 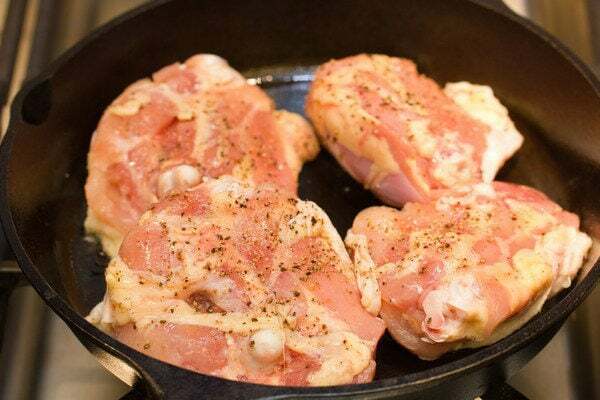 I love using chicken thighs for cooking even though I don’t use these so often anymore because my husband doesn’t like eating meat with bones 😉 (he’s missing the fun part, you see…;)). Can you make prawn tempura one day, Nami? It’s one my favourite Japanese appetisers :). I know how to make tempura, but I am always curious to learn other techniques, especially from a Japanese person :). Congrats on the magazine gig!! Way to go! Love Love Love this cacciatore Nami, its 10 am & my mouth is already watering 🙂 The chicken skin has crisped perfectly.I need to post some of my fav pasta dishes soon..havent made any at home for a long time.All the best! Thanks Tanvi! 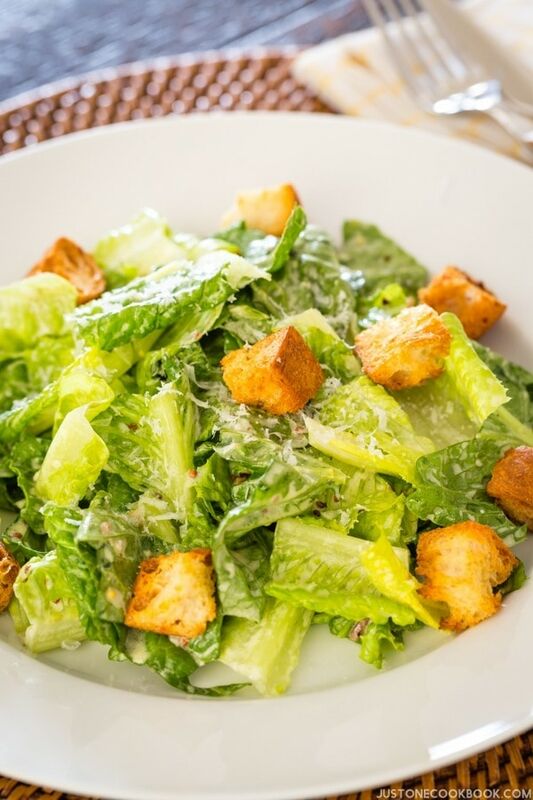 I can’t wait to see your favorite pasta dishes! They must be good…made by you!!! I love anything with pasta. I’m looking forward to it! Nami – this looks absolutely wonderful!!! I love mushrooms, and have never had this dish with mushrooms before 🙂 And, a huge congrats to you on joining Parent Palace – what a fun new adventure!!! What a lovely dish. Filipinos love dishes like this. We have a lot of tomato based dishes which we eat with rice. This one I will definitely eat with spaghetti. 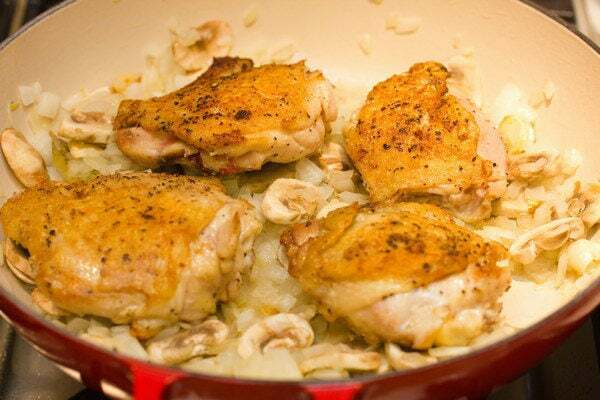 Wow this version of chicken cacciatore looks great. I usually add a tiny bit of dried porcini. The dried porcini add some great flavor to the whole dish you should try it the next time! I see. I would love to try your method next time. I like the fining in oven part too… great idea! What a wonderful opportunity to have your recipes posted there! I will definitely head over to see the site. I have to catch up here too, (I’ve been sick with bronchitis), and it looks like you’ve been busy posting beautiful recipes. 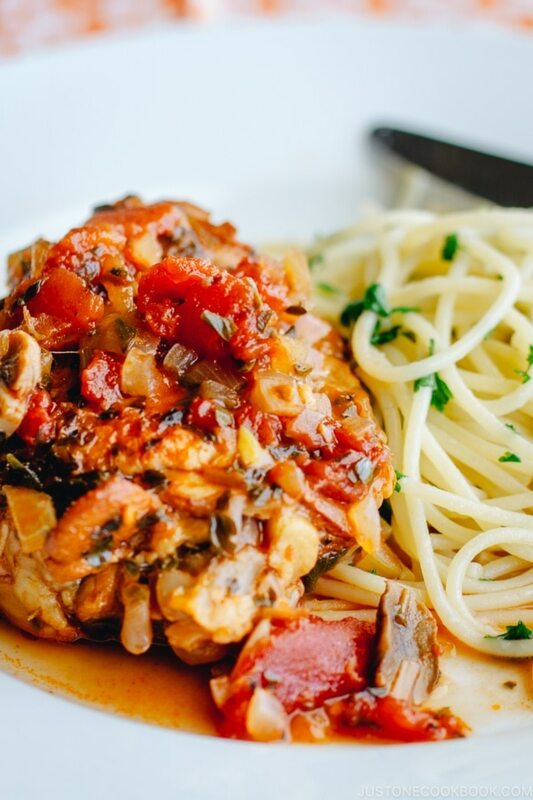 Our family enjoys a version of chicken cacciatore too, but I look forward to trying your recipe soon! You are too sweet Nami. I hope you are continuing to feel better. I think I am getting better little by little. Definitely the sickest I have been in 15 years! The bronchitis is taking my breath away and making me SO tired. I was barely able to hit the post button on my last post. 😉 Thank goodness I had been sitting on that one for awhile too. I guess you do the same thing! The weather has been cold here too! Take care. Oh my… Terris. That sounds pretty bad. I wish I live closer so I can bring something. Well it’s Friday now, so please rest up this weekend. I know it’s not easy around the kids… Get well soon! Hi Nami! Congratulations on your first guest post! Thank you Luciana! I was really excited about your new post today. 🙂 Beautiful as always! Congrats Nami, I am so proud of you! 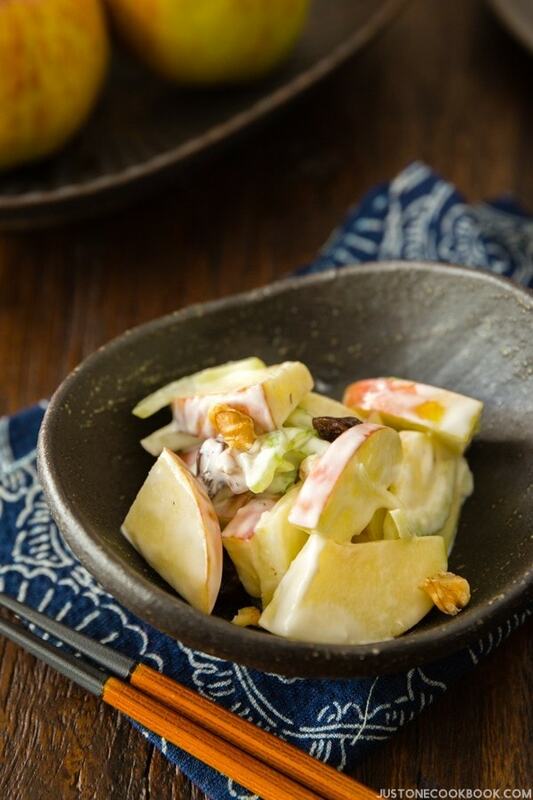 This recipe is not only beautiful but sound extremely tasty! You did incredible job!! !I will check that site now and every Wednesday!!!! Thank you Sandra! You just made a fantastic Italian course meal and I’m too shy to show this Cacciatore. Hehee. I’ll cook this for you, if you cook those course meal for me! LOL!!! So happy for you and what a fantastic dish for your debut. The magazine made a wise choice asking you to be a part of it. Nami, that’s wonderful news!!! Congrats. My husband doesn’t want me to make cacciatore, convinced that it’s not very good. But yours looks so gorgeous, I may have to try to change his mind with it! 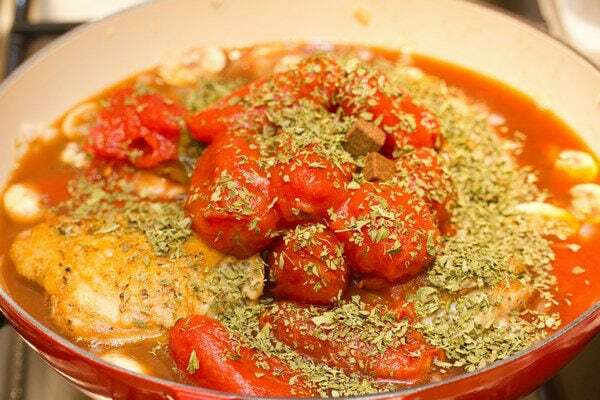 Delicious looking Chicken Cacciatore – love the use of the bay leaves. I have just recently discovered your blog, Nami and I love it! 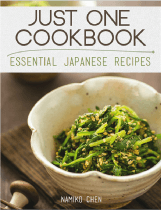 Finally a great resource for all my favorite Japanese recipes. 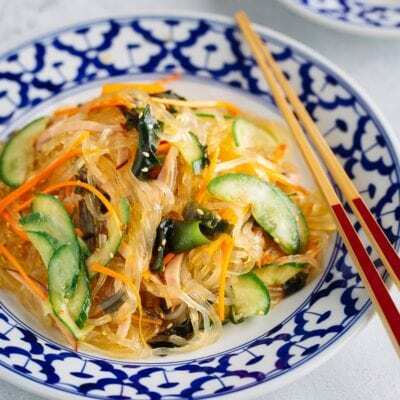 You seem to have all the oishii dishes I remember from my years of living in Tokyo. Although if I could request a new “How-To” guide, it would definitely be “How to Prepare Japanese Rice”. Keep us the excellent posts! Hi Robert! Thank you for stopping by my blog and leaving your kind comment. I’m happy to hear you like my site. Ohh if you live in Tokyo, then you know all the good Japanese food. 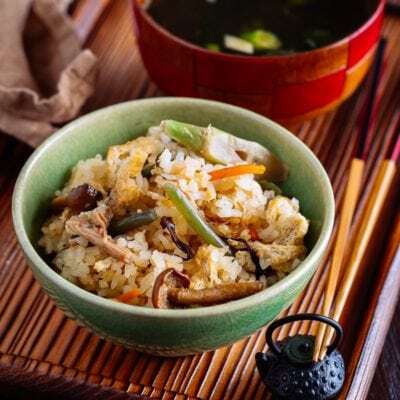 😉 I actually wanted to do how to prepare Japanese rice…because we have a “right” way of rinsing the rice and preparing to cook. Do you need to know how to cook in a pot? I actually never cooked on a stove… I’ve been so busy that my “How To” page has been neglected. 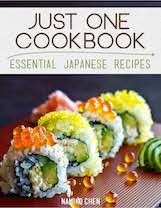 I’ll definitely update with How To Prepare Japanese Rice. Please give me some time…. 🙂 Thank yo again for visiting my site! Thank you Mary! My kids love tomato & pasta combination a lot. I know they would as long as they are in the dish! 🙂 Thank you, and I hope you have a great day too! This dish looks beautiful!! 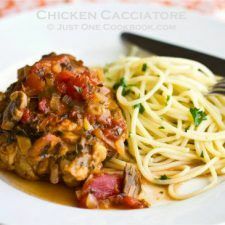 Love chicken cacciatore and I love that you used the chicken thighs too. I think they have so much more flavor than chicken breasts. Yum! I can not believe I have never made chicken like this. Must try – the sauce sounds fantastic! Thank you Manu! Wow this becomes more “soup”? I wish I can try real authentic one! Italian food is very simple and I really love Italian food. I’m getting better and my kids too. Hopefully we can recover before next week! 🙂 Thank you for your well wishes! Thanks! 🙂 Al dente is sooooo important! 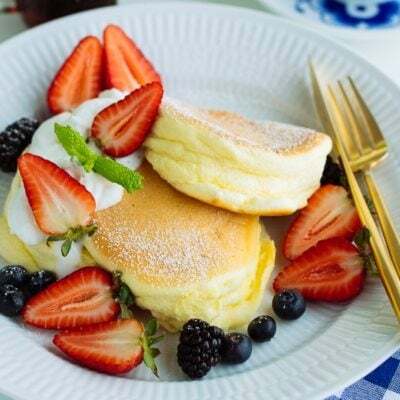 Hi Nami, That’s a lovely dish that I definitely love to try 🙂 Love your pictures! Hi Nami, Thank you very much for coming to my site. Hope you’re getting better now and have more rest. It is so sweet of Sandra and I heard a lot about your lovely blog from Sonia of Nasi Lemak Lover that I met her in person two days ago. 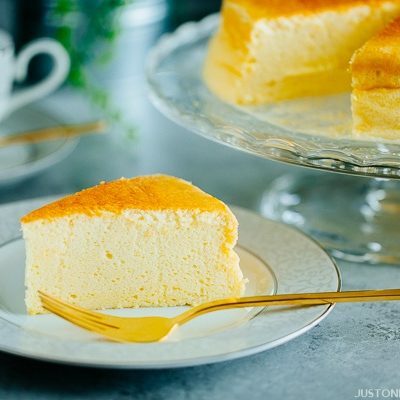 I must say your blog looks great that I can learn many interesting recipes from you. Thank you for following me, I will follow you on FB as I can’t find the FriendConnect here. Thank you Anncoo! Yes I’m feeling much better. Thank you for letting me know about Sonia. I just went to her site to thank her too. 🙂 Um… I’m not sure what FriendConnect… sorry I’m still sort of new what I “should” have on my blog… haha. Thank you so much and I’m happy to get to know you more! Wow, congrats on the recipe writing gig!! That sounds like a perfect fit for you! I really like the way you write, with clear step-by-step instructions and photos. I can tell right away whether it’s something I’d like to try and I’ll know exactly how it should proceed. I appreciate that when looking for new recipes to try. Thanks Sheri! My kids love tomato-based too. Well I’m glad to hear step-by-step pictures. Although it takes more time to cook while taking pictures, I find it helpful for myself (I read English so slow, so I need my recipes to be visual too) and hopefully for my kids when they get older… 🙂 Thank you for your kind comment! Nami, what fabulous news – congratulations on being a featured guest blogger on Parent Palace, your contributions are going to bring you so many more opportunities. Your first contribution is a great meal. Thank you Marsha for your well wishes! My kids and I are getting better. Just a few more days then I will be 100% better! 🙂 Thank you for your sweet comment Marsha! I love the Le Crueset Braiser too, you can use it for so much stuff. I sometimes make enchiladas in it. Hi Kayo-san! Thank you. 🙂 Did you notice that Braiser is “red”??? 😀 I bet yours too. Haha. Oh please teach me how to make echiladas one day? Congrats on your 1st guest post ! 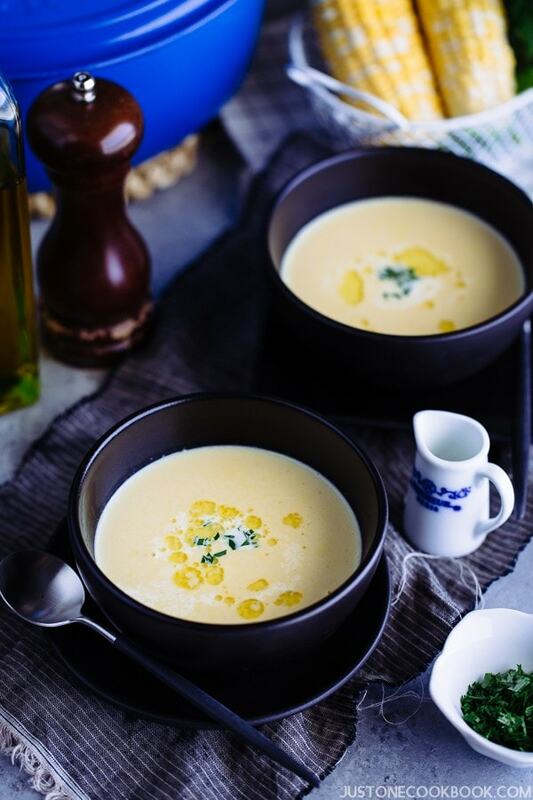 Love this kind of simple and comfort food, must try one day. Thanks for sharing Nami! Thank you for your kind words Sonia! 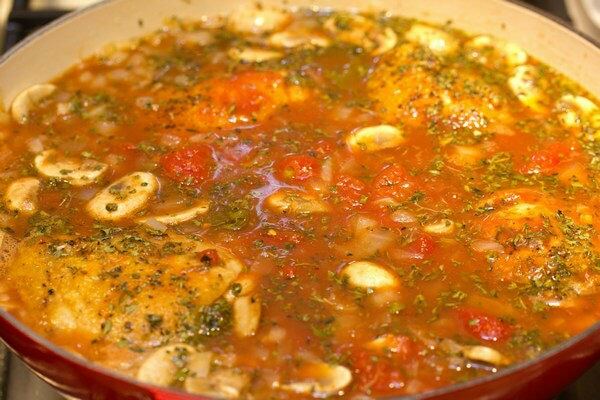 I love one pot meals like this chicken cacciatore dish. It is attractive, tasty, and best of all the cleanup is so much easier. Congrats for your up-coming guest posts on Parent Palace! How exciting! 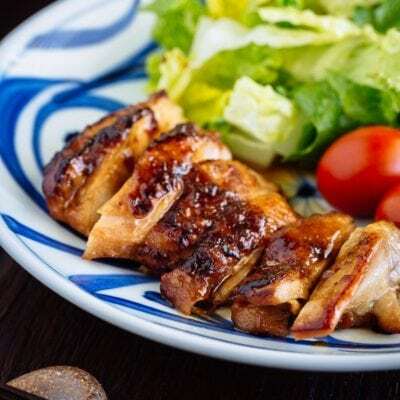 Oooh Nami this dish looks absolutely mouth-watering! Your pics are always amazing! Congrats on getting to write for another website! 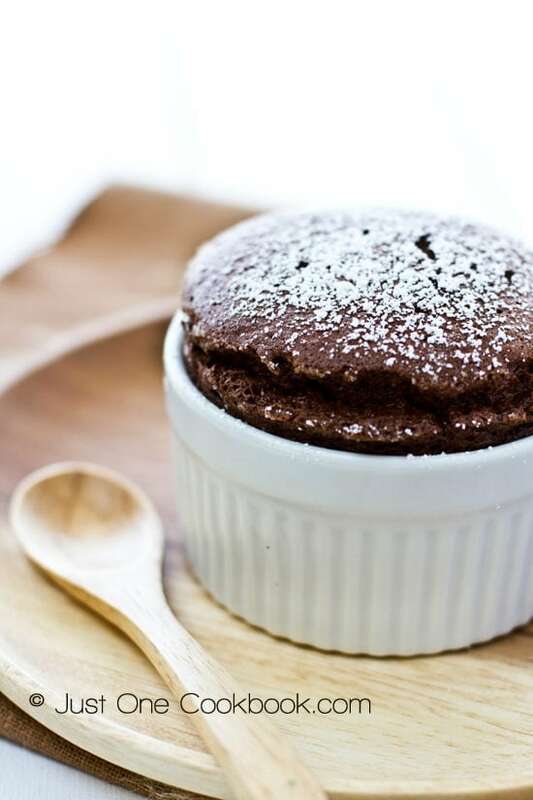 I have a feeling all the readers will LOVE your personality and delicious recipes… like today’s! The recipe, as an “usual phenomenon’ with your posts, is simply awesome! 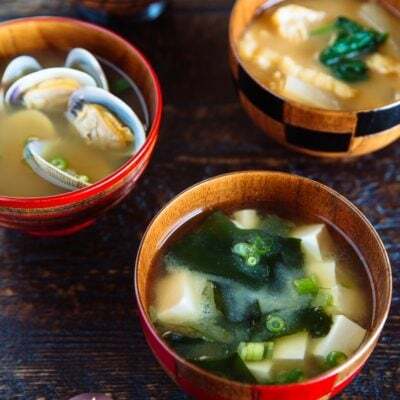 Nami, I have tried Japanese cuisine here in Hong Kong in a restaurant called Ajisen Ramen and I am in love with japanese delicacies now! looks amazing. I actually make a very similar version all the time, it’s easy. Just like Chickecn Piccata 🙂 Nice Post! How wonderful Nami! I am so excited for you on the new milestone! I think your blogging style and genuine love for your family, cooking and all your Foodie Friends really shines through. So proud of your accomplishment and can’t wait to see what wonderful news will come your way in the future! Now onto your recipe, I am surprised by the Italian influence of Japanese cooking, it looks yummy and healthy at the same time (all the tomatoes and mushroom)! I think I only tried chicken cacciatore a few times – one time was in Maggiano and the chicken was utterly dry! Yours must be so moist, juicy and succulent, and with tomato-sauce, what’s not to love? Thank you Kate! Oh I used to watch that show! It’s one of my shows that I could understand listening in English (caption is always on – haha). Well obviously I didn’t get that the Mom and Cacciatore connection… Hopefully my English is better now that I can understand the whole show. Hehe. Thanks Kate! congrats on the new site Nami! 🙂 I’m sure it’s awesome. And this dish – I love it already. 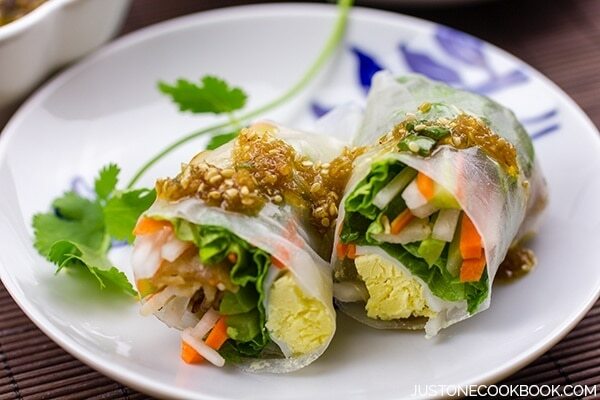 Great for weeknight meals. This is such perfect comfort food! I could happily eat a plate of this for dinner tonight since it is STILL so dark and ugly outside!! Seems like a dish that could really warm you up. And congrats on the new gig at Parent Palace…very cool! Hi Karen! It’s been raining and I wonder when we start to have warm weather… Have a great weekend and thank you Karen for your comment! Is something wrong with your site dear ? I have been trying since morning .. and finally am in. This is such a fantastic meal.. I have noodle at home but no chicken. See, you are making me hungry !! Nami – Congratulations on your feature! They are lucky to have you as a contributor. I hope you share lots of Asian recipes. Represent girl! Hi! 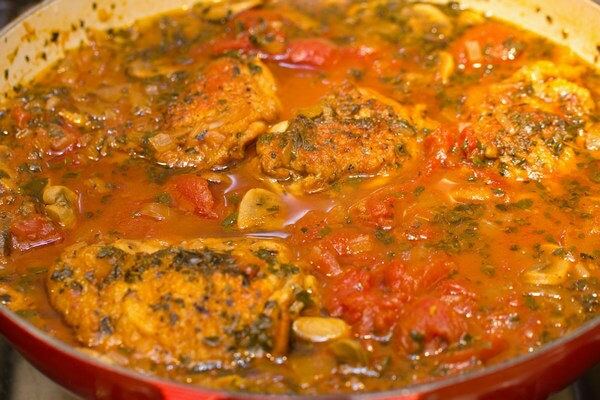 Nami looks wonderful chicken cacciatore! congratulations for top9! Thanks C & MSP! I still remember we talked about spaghetti bolognese. 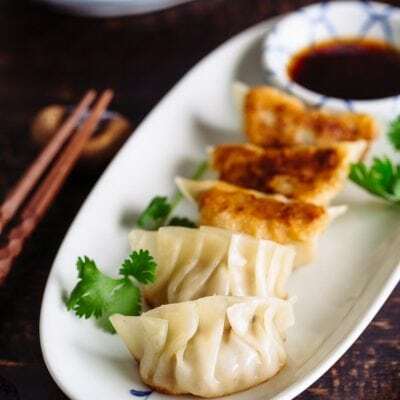 Actually after I saw yours, I cooked my version (hehehee) and I wrote a post…but I am trying to focus more on “asian” theme here so I keep losing an opportunity to share the recipe. But it’s on the way. It’s one of my comfort food growing up and still my favorite top 3 pasta. 🙂 Thanks for visiting C & MSP! Another achievement for our lovely Namiko! Your regular contributions to the other site will bring you even more fans and stardom.. ;-). As usual, your pasta looks scrumptious, and I’m now trying to work out if I can leave my family and be a part of yours for a few months! You guys eat really well! Congratulations on your top 9..very well deserved..
Congrats on your guest post! You are really really doing awesome! BTW, I have the very same braising pan in red. I love it! Looks great enough to serve at a dinner party. Congrats for making the Top 9! Thank you for stopping by and thanks for your kind words Michelle! Well, Nami! Just found your site this AM, got quite a surprise when I saw a Japanese gal doing an Italian dish! First I am NOT a blogger, just an old guy who has been cooking since 1947, same year I met my wonderful girl who became my wife 2 years later. In 1950 I was in hospital with appendix and room mate was Italian artist, who gave me his mother’s recipe for pasta sauce(gravy)! Then years later I learned to cook Chinese, beginning with Chow Fan. 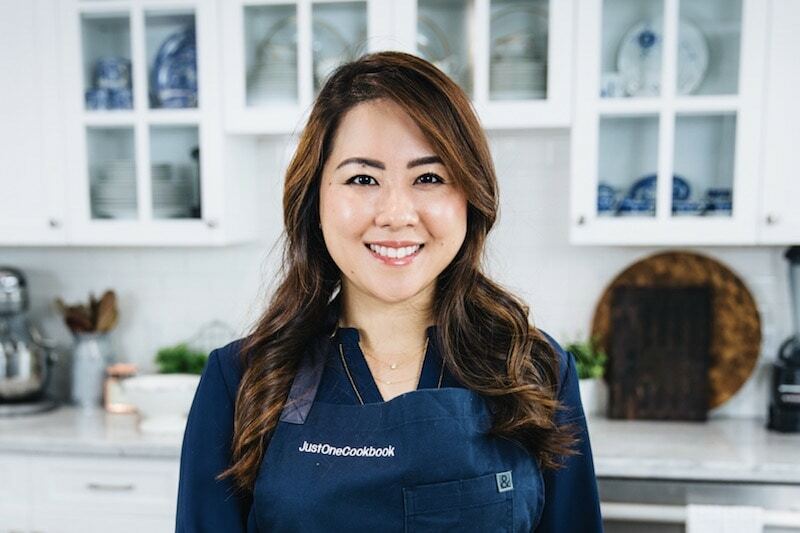 Graduated to other Asian dishes years later, now I cook every Asian cuisine EXCEPT Japanese!! As well as Greek, German, Irish, my heritage, and just about anything. 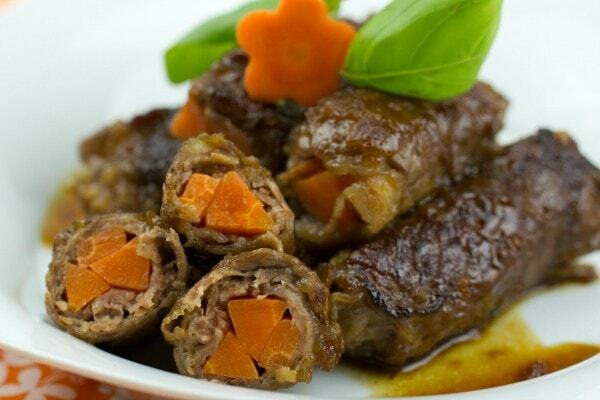 Have been doing Thai for a couple of years now, wonderful cuisine. I will do your recipe today and let you know how it turns out! Thank you for your site, your family look great! Cheers, Old Doug & Marie in BC, I cook, Marie bakes, including our read! Hello Doug and Marie! Thank you so much for stopping by! I enjoyed reading your story and thanks for sharing! Italian dish is quite popular in Japan. We eat pasta pretty often, and some of my neighborhood Italian restaurants in Japan are much better (more authentic) than my neighbor Italian places in the US. Many housewives in Japan cook Chicken Cacciatore, but each one probably makes it slightly differently, I think. It’s one of “common” food we cook at home. I hope you enjoy my site. There are more food we eat besides sushi, tempura or chicken teriyaki. 😉 I’ve just started my blog this January, so my collection is sort of limited, but I hope you will come back and check new recipes. Thank you so much for your visit and you definitely made my day! Congrats on the Top 9, Nami!! This one is a family favorite in our household!! This chicken sounds delicious! It looks so good too! Can’t wait to read more of your blog! It really is nice to see someone still cooks using dark meat of chicken with skin and bones. Too many chefs lose their credibility by using boneless, skinless breasts. I know Ellena from a friend of mine – her blog are amazing! So beautiful! The ultimate comfort food. I’m definitely making this tonight! Hi Cindy! Thanks! I’m glad to hear you like my step-by-step. It’s not perfect, but if you get a sense of what I’m doing during the process then I’m happy. 🙂 I should cook this again soon… it’s good! I made it yesterday, but I had it with macaroni. I added some cream cheese and tuna to the macaroni, and had it with the chicken cacciatore. It was awesome! The sauce was sooooo good! I live in the students’ dorm and hence use the common dorm kitchen. Everyone was saying how good the food was smelling and asking me for recipe! I recommended your wonderful website and the same night, my neighbour was cooking Chicken Cacciatore too! She had it with roasted potatoes though. I am going to make it again for sure! I made this last night for a girls out dinner party. I do not cook so I was looking for something that was somewhat easy to make. This was so delicious. Everyone loved it! I impressed myself. Can’t wait to make it again. Hi Nami..I don’t have Marsala Wine..can I substitute it with other type of wine? Like white wine? Or Chinese cooking wine? Hi Angie! White wine is okay! 🙂 Hope you enjoy! 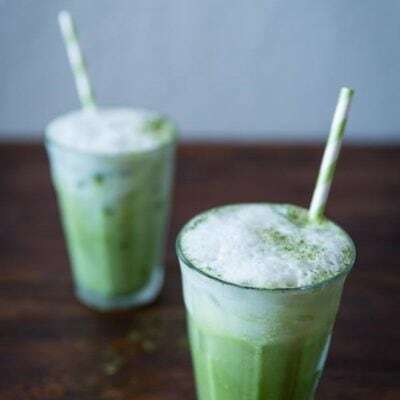 awesome ,easy ,,healthy recipe..loved,saved,and posted to my social media.. This looks delicious & amazing! I have to add however, that the addition of mushrooms & Marsala wine practically turns this dish into Chicken Marsala (without the missing Sherry wine). Having said that, very nice recipe & presentation. Thank you for sharing. Hi Jorge! Thank you so much for your kind feedback!